Research results indicate that “the number of children who experience handwriting difficulties can be upwards of 27% in the primary grades (Volman, van Schendel, & Jongmans, 2006, as cited in Collmer, 2016, xiii). Experts have identified a current trend that may result in handwriting difficulties and an inefficient pencil grasp: presenting toddlers and preschool children with pencils and pencil activities before their motor muscles are ready for this complex fine motor task. (Collmer, 2016, p. 28) Proper development of the muscles of the hand, both intrinsic and extrinsic, assist the writer in maintaining his grasp without pain or fatigue, with grip strength correlating with handwriting legibility in typically developing children. (Collmer, 2016, p. 29) As occupational therapists, we play a key role in alerting educational staff about the hazards of pushing children into forming inefficient handwriting habits. However, what do we do when we are presented with a student who has been struggling with his handwriting skills for quite some time; and who now, at the age of 9, is attempting to keep up with his peers in handwritten assignments? Where do we begin? I did agree with this therapist that a common reason for a static tripod grasp is poor postural support. Taking that assumption a step further, inefficient posture can also be an adaptation for the underlying reasons for his inefficient pencil grasp. Poor shoulder, arm, wrist, hand, and finger muscles may cause the writer to grip the pencil tightly, brace his arm and elbow against his body, and produce movements from the shoulder instead of fluidly moving his hand and arm across the page. I was excited about helping this therapist and her young man and I dove right in with a suggestion or two. Since I had not seen this student’s grasp, I provided a strategy that I felt would help in most cases, discussing it as a step-by-step process from which I’d typically work. Of course, we’d work on more than one strategy in the list at a time, with those presented close together complementing each other. Both she and I thought it would be a nice idea to share it with you, too! At this age, I turn to a very basic assessment that looks at shoulder, arm, wrist, and finger strength. If it is determined that the grasping problems result from strength issues, then I begin there. Experience has shown me that most times it will be! At the start, I tend to do very little handwriting practice or paying much attention to changing the child’s grip during handwriting tasks, as most likely that is like trying to get blood from a stone. Often, there’s been lots of practice and there’s been tons of hours spent on tips and tricks to change his grasping pattern with little success. The frustration meter at this point has been pegged out for everyone concerned. I’ve found the most success comes from working strictly with strengthening activities designed to address the child’s particular areas of concern. I’d begin by concentrating on palmar arches and separation of the two sides of the hand. There are plenty of exercises and activities that concentrate on these skills and can be adapted to his developmental level, helping him to open his web space and attain flexibility in his fine motor movements. It’s important to be sure that he can perform thumb opposition efficiently, as well. If not, include activities for that in this step. This sets the stage for the following strategies. At the same time, I would work on shoulder stability with upper body exercises or yoga activities. Select activities that allow you to monitor progress with repetitions or quality of production, such as the plank, wall pushups, and indoor volleyball between you and him. Work on drawing, sketching a map, or visual perceptual copying tasks on a vertical surface (such as a wall or window or chalk board – no dry erase please! ), working with his wrist extended to 20 degrees and about 10 degrees of ulnar deviation. You won’t have to be as vigilant on correcting his positioning if he is working on these types of vertical surfaces since they will most often position his wrist and arm correctly by default! Working on wrist extension on a vertical surface before tackling the thumb positioning. One step at a time! Designs with Wikki Stix on a vertical surface to promote optimal wrist extension. When he begins to experience some progress with No. 1 above, I’d include some bilateral fine motor activities such as molding clay or those that include cutting or putting things together. This will begin to include his wrist and fingers of his dominant hand with help from his non-dominant. Be sure he is resting his arms and hands on the table at first. If he is performing everything “in the air,” chances are he’s using his shoulders to brace himself and he is less likely to move his hands and arms fluidly across the table (even in small bits) during the task, which is the goal in handwriting tasks. Be sure that during these tasks, you are reminding him of the postural “must do’s” that you have been working on so far – back slightly bent toward the table so that he can see his work, elbows on the table, knees in front, feet flat on the floor. I have to confess, I’m not as strict with every part of this as I used to be. If the posture is working for the task and the child is not experiencing discomfort due to it, then I let it go and move on to the other things I’m working on. If the posture is hindering the task, I have the student remind me what he needs to fix. It helps to have a sign on the wall or a note on the desk that he can refer to during the activity. My favorite set of yoga exercises! After some more progress is achieved with 1 and 3 above, which will be demonstrated by less dependence on his shoulder for movement and increased flexibility in his arm and wrist, I’d add fine motor exercises – not tasks or activities. Strictly the same types of exercises that we would do with adults in a rehabilitation setting. (I’ve included a handout for putty exercises in my downloads for my book.) They are simple to demonstrate and easy for him and his parents to follow at home….and they work. I am leaving this until he has some upper body improvement because, as you know, development is proximal to distal. Once we can get him to stabilize his shoulder and begin to move his arm in tandem with his hand, then he can begin to include fine motor movements to tie it all together. The exercises are static, however, and do not involve much arm movement. I try to mix the exercises in with some of the other activities above to add movement. For instance, I might have the student perform one upper body exercise and then move over to the table for a fine motor, sequencing like that until both sets of exercises are completed. Or I like to have them play a dice game where each number is attached to an upper body or fine motor exercise. The student checks off which ones he’s completed and we roll the dice until they’ve all been done. This way, the arm is working as well as the fingers. It works to enhance flexibility. You can also have the student perform the exercises standing up when his fine motor skills begin to get stronger. This allows him to move his arms without support. But be sure he’s not using his shoulder to stabilize too much! When the above strategies are moving close to his final goals for those skills, I’d move on to adding about 5-10 minutes at the end of the session to work on activities that include handwriting – slowly at first. I begin with a reminder of the appropriate ways that the shoulder, arm, wrist, hand, and fingers work together toward efficient handwriting skills. Handwriting program workbooks often have great visuals to remind students of the placement of these parts. (I know Universal Publishing’s books have great ones.) I keep a checklist on the desk where the student can self monitor his positioning. We work with tasks such as copying spelling or vocabulary words from the board in therapy to take home for study. Even if this is a repeat of what he’s done in class, the task completion is being monitored by you and the student can actively practice his self monitoring techniques for use at home or in the classroom. I like to have them write down directions to their home or the park or movie theater, make a list of items that they will need for their next camping trip or for what they want for lunch, or draw a picture and write a short, short description of what is happening in it. It depends on what the child likes to do for fun. Be sure to continue to include upper body exercises in his program to keep the muscles toned and ready for fine-motor work. Most children love to continue with the putty exercises, too. And that’s good because the fingers continue to need work at this point. If he tires of them, there are others on line that he can try that use other materials or exercise tools. It’s up to you and him. I am pretty consistent in the method of my delivery, moving from gross motor, to vision skills, to fine motor, then function in my sessions, as I’m sure you all do. I didn’t include any vision in the above, but these skills could easily be addressed in both types of exercises. I really enjoyed working with this therapist and am looking forward to hearing her feedback about her student’s progress toward handwriting mastery! As always, thank you so much for reading and sharing my work! The Handwriting is Fun! Blog is published by and is the property of Handwriting With Katherine. Collmer, K. Handwriting Development Assessment and Remediation: A Practice Model for Occupational Therapists. 2016 ed. Waymart, PA: Universal Publishing, 2016. Print. Pictures are the property of the author and must provide a link back to this article or her website. Those that provide a link to the originating source should include that link when they are shared. Technology comes in various packages, from the most expensive to the budget friendly. It has become a staple in our lives, as well as an effective means for adapting school requirements to meet a student’s needs. Rebecca Klockars, an occupational therapist and RESNA certified assistive technology professional, shares adaptive strategies that will not make a big dent on your therapy budget. Katherine J. Collmer, M.Ed., OTR/L, is a pediatric occupational therapist who specializes in the assessment and remediation of handwriting skills and understands the link between handwriting skills and writing. In her current book, Handwriting Development Assessment and Remediation: A Practice Model for Occupational Therapists, she shares a comprehensive guide and consistent tool for addressing handwriting development needs. She can be contacted via her website, Handwriting With Katherine. Pictures are the property of the sites they are linked to and their use must provide a link back to the owner. Frank R. Wilson, in his renowned discussion of the evolution of the hand, poses the suggestion that bimanual tasks result in the development of a visual vocabulary. He defines a “visual vocabulary” as one that is established as a result of a mysterious, nonverbal language. This language can be witnessed in the arts, from jewelry making to writing, as each creator uses “internalized rules for combining materials and structural elements” to produce unique patterns of work. These works of art take on a meaning for both the designer and viewer and become the personal stamp of the creator. (1) In this sense, handwriting can be defined as a nonverbal language that results from the production of lines and shapes that are placed within spatial constraints according to predetermined directional and alignment rules. They become words and sentences that take on a meaning that the writer conjures up in our minds to share thoughts, feelings, information, and knowledge. Although Wilson describes handwriting as a task commonly considered to be a unilateral hand skill, (1) one that is considered by researchers to require only the “specific coordination between the finger and wrist movements” of one hand, (2) it appears that handwriting under the label of a visual vocabulary would then be considered a bimanual task. The production of a visual vocabulary, in the arts and handwriting, depends on the ability of the hands to form a complementary partnership in their role as a vehicle for expression. This partnership consists of a dominant and non-dominant hand that become one unit in the completion of bimanual tasks. Brain lateralization and the intercommunication between the two sides of the brain have been considered the foundational requisites that facilitate the establishment of a dominant hand and determine handedness in humans. However, the establishment of hand dominance remains a confusing and baffling human trait that scientists admit there is little known about its history or neurologic foundations. The study of the evolution of handedness has taken anthropologists back to an examination of how the hands were used by our Stone Age predecessors to wield stones as hammers to create tools for building or cooking or to design weapons intended to kill game or to act as protection against predators. Their studies revealed that the tool users would have divided the tasks of hammering or throwing into two distinct parts, utilizing one hand to steady the object to be hammered or to balance the body against gravity in throwing and the other hand to perform the precise movements necessary to direct the stone toward a target with accuracy. This division of labor has been labeled as the dominant and non-dominant hand movements. Hand dominance has been suggested to have been a “critical survival advantage” to hunters and gatherers as they engaged precision tasks within their competitive environments. (1) Given that precision tasks demand practice for mastery, their consistent use of one hand to perform and perfect an accurate aim-and-throw movement may have organized the brain-hand pathways and established a hand dominance. Again, the baffling question remains: Why did these early humans select the right versus the left hand for precision tasks? While scientists have yet to uncover the answer to this conundrum, they have turned with equal wonder at the mystery of the perceived underdevelopment of the non-dominant hand. Some ask the question, “Did it stagnate? Was it ‘dumbed down’ somehow, in order to guarantee the emergence of a manual performance asymmetry?” Or was the non-dominant upper limb intended to become specialized in a different way? (1) This latter view of the non-dominant hand suggests that the two hands are complementary, forming a whole that is dependent on the accurate production of the specified movements of both sides. This is an enlightening perspective on the role of the non-dominant hand, for sure. Dominant and non-dominant hands were once referred to as the “good” and “bad” hands, with the non-dominant hand being labeled as the “somewhat disabled one.” (1) The right hand was viewed as the “good” hand despite the occurrence of left-handedness in some children. Left-handedness, in fact, was considered to be a deficit and children were strongly encouraged, sometimes forced, to ignore their tendency to use their left hand and to switch instead to their right hand for writing and drawing. The argument and prejudice against left-handedness was promoted by the confusing fact that an overwhelming number of people were right-hand dominant. In the end, regardless which hand became dominant, the non-dominant hand was believed to be an unequal force in the production of bimanual tasks. It was considered to be inferior to the more precise hand. As researchers began to investigate more closely the interaction of the hands in bimanual skills, they questioned this idea and considered instead the likelihood that they were interdependent. Bimanual tasks, by definition, involve the use of both hands. While some bimanual tasks can be accomplished with the use of one hand (as evidenced by the rehabilitation efforts of persons who have suffered from a stroke), most often the speed, fluidity, and accuracy of their production are compromised by the lack of a supporting hand. In general, then, bimanual tasks demand the use of both hands for efficiency, as is seen in activities such as playing a musical instrument, golfing, tying our shoes, cutting our food, and handwriting. The precise, rehearsed, and preprogrammed facets of handwriting rely on the supportive role of the less-precise hand to guide the dominant one in producing the “collection of identical hash marks” (1) that create an individual penmanship style and comprise the visual vocabulary that delivers each writer’s personal message. The supporting role of the non-dominant hand places handwriting among our most creative bimanual tasks. In this light, an assessment of handwriting development skills would warrant an evaluation of the behaviors demonstrated by the supporting hand and rehabilitative efforts designed to develop it to its highest skill level. Photos are the property of online sites or the photographers at Pixabay. Their use should include the link provided with the pictures. All other photographs are property of the author and are not to be used without her written permission. (1) Wilson, Frank R. The Hand: How Its Use Shapes the Brain, Language, and Human Culture. New York: Pantheon, 1998. Print. (2) H. Reinders-Messelink, M. Schoemaker, and L. Goeken, Kamps, W. “Handwriting and Fine Motor Problems After Acute Lymphoblastic Leukemia.” Handwriting and Drawing Research: Basic and Applied Issues. Amsterdam: IOS, 1996. 215-25. Print. (3) Guiard, Yves. “Asymmetric Division of Labor in Human Skilled Bimanual Action.” Journal of Motor Behavior 19.4 (1987): 486-517. Web. Hand dominance is a key factor in handwriting mastery. Handwriting is a complex functional task that demands the hand to work efficiently with a tool. This is accomplished through the hand’s intricate link with the brain. Handwriting is considered to be the highest form of unilateral hand dexterity skill attained by the general population. (1) The establishment of hand dominance provides the child with a skilled hand for efficient pencil control to facilitate the learning of letter formations and line alignment as well as a stabilizing hand to monitor paper placement. What is hand dominance or handedness? Hand dominance is the term used to describe the hand a child is observed using spontaneously during skilled activities such as brushing his teeth, using scissors, or handwriting tasks. It is the hand a child naturally prefers to use because it performs skilled tasks more efficiently, leaving the other hand to act as a stabilizer. For example, a child who is right-hand dominant, or right-handed, will use his right hand to manipulate the scissors and his left hand to stabilize the paper during a cutting task. The development of hand preference is a sign that the brain is maturating and that brain lateralization is occurring. Initial development of a preferred hand occurs from about the age of 4 months to the age of three to four, shifting from a reach that is convenient (such as using the right hand to pick up objects on the right side) to one that crosses the body’s midline. Hand preference for the completion of unilateral tasks becomes more evident during this time with further bilateral differentiation occurring between 5 and 7 years. Although children may continue to switch preferred hands at this stage for use with different fine-motor skilled activities, a fully established hand dominance presents itself between the ages of 6 and 9. What are the behaviors associated with an Unestablished Hand Dominance? the midline and bilateral coordination are contributing foundational skills for the establishment of hand dominance and equally important in the performance of skilled tasks. Difficulties in either of these skills can result in unilateral hand preference (using the right hand for performance on the right side and vice versa), difficulty with symmetrical bilateral hand skills such as catching a ball or holding an object with two hands, or competing dominance where the child switches hands during a fine-motor task. It is also important to note that if a child who demonstrates a clear preference for one hand is observed switching between his dominant and non-dominant hand during skilled activities, muscle fatigue could be the underlying cause rather than difficulty with any of the above skills. How can you determine the Establishment of Hand Dominance? There are several ways to determine a child’s preferred hand and to determine the establishment of hand dominance. Observe the child participating in skilled fine-motor tasks such as brushing his teeth, buttoning his coat, drawing, playing with construction toys, or cutting paper. Record the number of times that he uses a specific hand as the dominant one within each task, switches hands within the task, or uses only the hand located closest to the object when reaching for it (e.g., using the left hand solely to reach for items on the left side). Place items at the child’s midline on a table during a fine-motor play or functional activity. Observe the use of a dominant hand or the switching of hands during the activity. 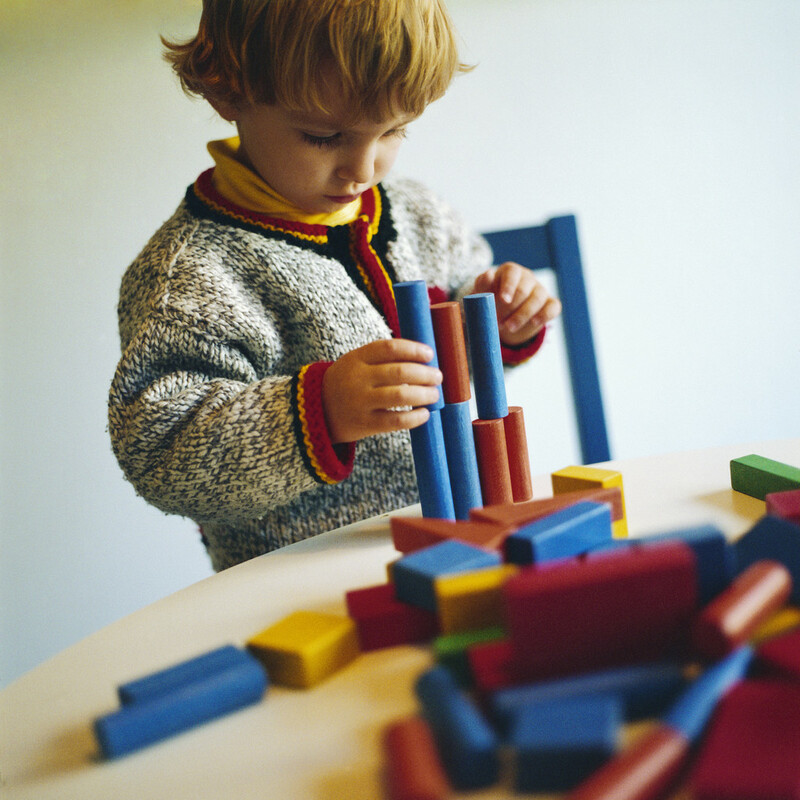 Place items for use in activities such as puzzles, tangrams, or construction tasks in random positions on the table on the child’s left and right sides as well as in midline. Observe his use of a dominant hand, his switching hands, or the use of a unilateral reach as he completes the activity. Activities that Promote the Development and Establishment of Hand Dominance. After collecting observational data that reflects the child’s level of hand dominance, determine the hand that he appears to prefer. Direct him to use that hand in activities that will reinforce it as the dominant hand. If the child does not yet appear to have a preferred hand, begin with the foundational activities below to encourage the development of a dominant hand. Progress to the activities that follow to enhance the underlying skills that promote the development and establishment of hand dominance. Place objects for a task at the child’s midline. This provides him with the opportunity to select which hand to use and enhances the development of a dominant hand by lessening the chances to use the unilateral hand to avoid having to cross midline. Use auditory cues to direct the child’s reach across his body during play and functional tasks. Positions items included in the activity randomly on the table on both sides of his midline. Ask him to reach for them using the opposite hand. For example, to direct him to reach across his midline to an object on his left, you might say, “Joey, please pick up the yellow marker with your right hand.” This activity also promotes the development of crossing the midline and bilateral coordination skills as well as the understanding of directional concepts. Use auditory and visual cues to establish labels for his skilled and stabilizing hands. This helps him to understand how he uses his hands for fine-motor activities and supports their use as skilled or stabilizing hands. For example, if the child has been observed to use his left hand predominantly during skilled tasks, you might verbally label his left as the “worker hand” and his right as the “helper hand.” Demonstrate these labels as you and he complete tasks such as cutting, lacing, or construction play. You may add a sticker to his worker hand to remind him of its role in the activity. Use auditory cues as reminders to continue to stay with one hand for the duration of a skilled activity. Gross motor games. Position balls or bean bags on the side of a child’s preferred hand and have him toss them at a target placed at his midline or on the opposite side of his body. This activity promotes the development of hand dominance, as well as balance, bilateral coordination, visual attention, and crossing the midline skills. Games of throw and catch (for example, baseball or bowling) and basketball (dribbling and throwing) also promote these skills. Fine motor activities. The activities below promote the use of a dominant hand as well as the development of visual attention, crossing the midline, and bilateral coordination skills. Drawing or coloring with the preferred hand. The performance of this activity on a vertical surface will further enhance balance and visual attention. Activities that include stencils, rulers, or rubbing motions over textures using the dominant hand with the pencil or crayon and the other hand to stabilize the stencil, ruler, or paper. Beading, lacing, and interlocking toys using the dominant hand to thread or position the interlocking toy while the other hand stabilizes the string, board, or opposite toy part. Cutting and pasting using the dominant hand to perform the task and the other to stabilize the paper. Construction activities with blocks, hammers, or screwdrivers using the dominant hand to perform and the other to stabilize during the task. 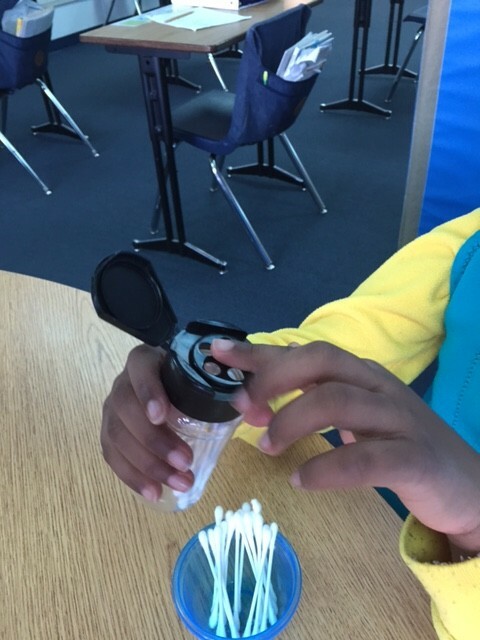 Opening containers using the preferred hand to turn or pull open the lid while the other hand stabilizes the container. Whole body writing (making large movements using the dominant hand) promotes the use of the dominant hand as well as the enhancement of motor movement planning skills. Activities that include non-traditional materials such as finger paints, shaving cream, sand trays, or writing with water on the chalkboard or a piece of paper taped to the wall provide increased tactile input to promote the use of the dominant hand as well as the enhancement of motor movement skills. 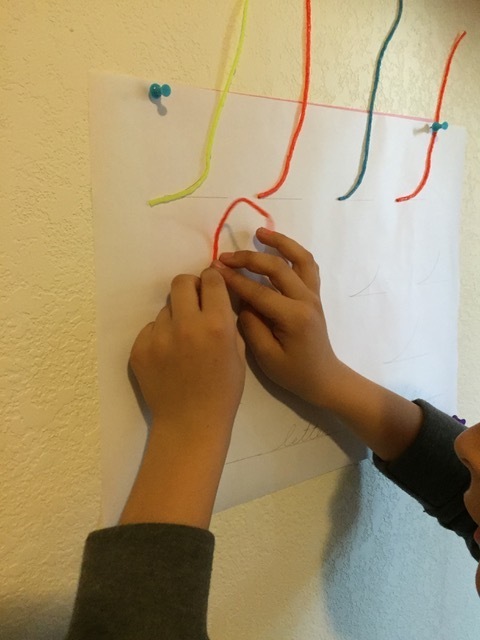 Create letter formations by shaping them out of pipe cleaners or other tactile tools to promote the use of the dominant hand. 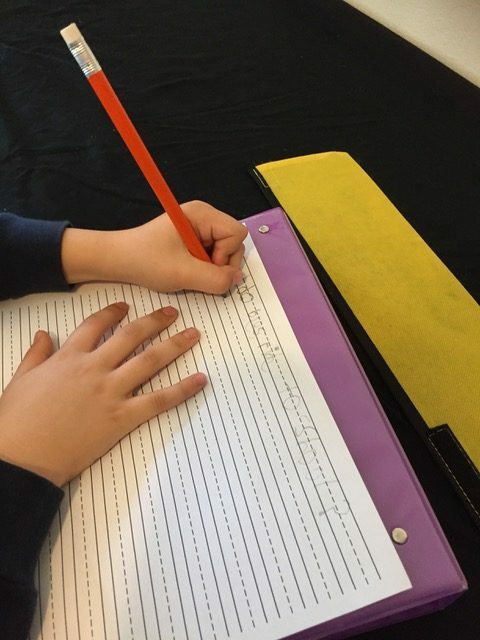 Writing or practicing letter formations with a pencil on a piece of paper over fine-grade sandpaper using the dominant hand for tool use and the non-dominant to stabilize the paper provides additional tactile input to promote the use of the dominant hand. 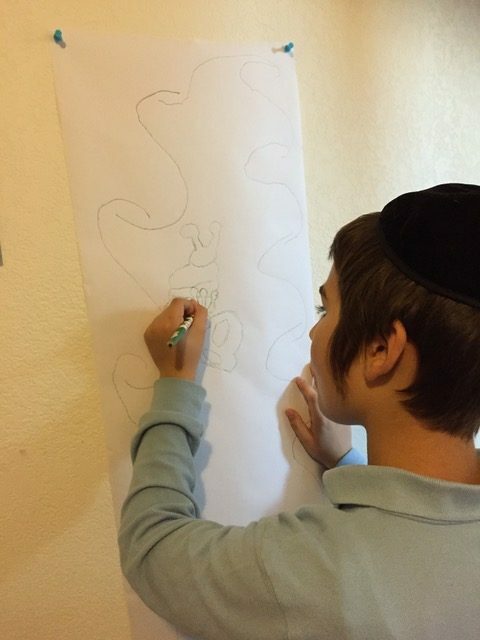 Tracing letter formations on a vertical surface using the dominant hand while the other hand positions and supports the paper also enhances visual attention skills. Children who have not established a dominant hand may also be working with inefficient body image and spatial awareness skills. It is important to observe the child in a diverse array of activities and provide a variety of opportunities to engage in bilateral tasks in order to determine the underlying developmental skill needs. Photos are the property of the photographers at Pixabay or Royalty-Free/Corbis where indicated. Their use should include the link or copyright provided with the pictures. Yancosek, Kathleen E., and David R. Mullineaux. “Stability of Handwriting Performance following Injury-induced Hand-dominance Transfer in Adults: A Pilot Study.” The Journal of Rehabilitation Research and Development JRRD 48.1 (2011): 59. Web. 28 Oct. 2015. “Texas Child Care: Back Issues.” Texas Child Care: Back Issues. Texas Child Care Quarterly, n.d. Web. 30 Oct. 2015. <http://www.childcarequarterly.com/spring07_story3.html>. “Occupational Therapy for Children.” Occupational Therapy for Children. Occupational Therapy for Children, 08 Sept. 2015. Web. 30 Oct. 2015. <http://www.occupationaltherapychildren.com.au/blog/dominance-hand-dominance/>. The month of August brings thoughts of the new school year and a fresh look at how children learn and grow. With that focus in mind, the Handwriting is Fun! blog is proud to bring you a series of posts that will share insights from Occupational Therapists that reflect their views on and visions for our students’ learning experiences. The second article in our series will explore the vital role that the process of learning to write by hand plays in our students’ ability to adequately present their knowledge and thoughts. I look forward to your comments and feedback – in handwritten form, if possible! He goes on to say that “any theory of human intelligence which ignores the interdependence of hand and brain function, the historic origins of that relationship, or the impact of that history on developmental dynamics in modern humans, is grossly misleading and sterile.” Studies have shown that the hand plays a major role in learning. And research is uncovering the impact that it has on the process of reading and writing. The hand, as it is utilized in the mastery of handwriting, is involved in the development of motor memory for letter recognition. And letter recognition has been found to be the most reliable predictor of future reading success. Handwriting, by definition, is writing done by the hand, in some cases that which characterizes a particular person. 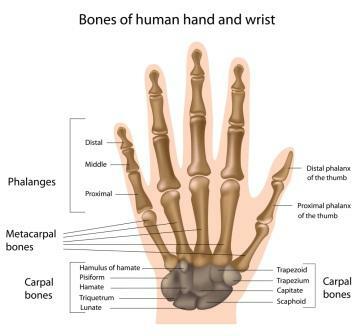 The hand has been described as giving “the upper limb its importance and originality.” (1) It is a complex unit comprised of intricate muscle, joint, and ligament components that create movements so flexible and dexterous they allow us to manipulate a grain of sand. The inside of the hand is innervated with neurons that relay signals to the brain relative to contact with objects, while proprioceptive information relative to finger and thumb positioning is transmitted through the joints, muscles, and ligaments. The tactile sensitivity of the fingertips (2) detects spatial differences allowing for receptive touch such as that used to read Braille characters. The hand extends from the body to engage, react, and defend. And, it is continuously working together with the other senses to enhance learning. 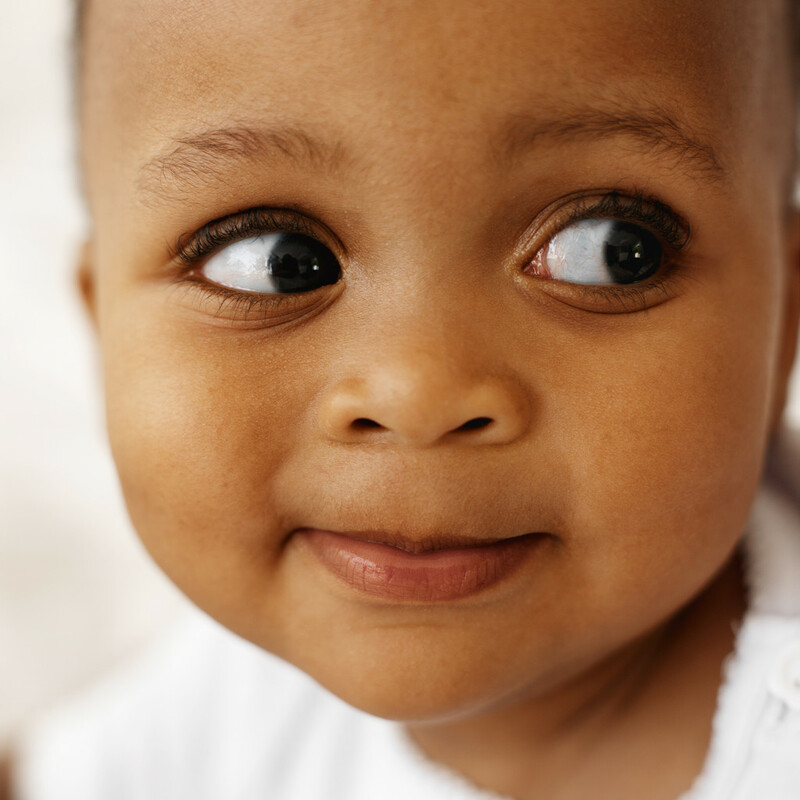 From birth, infants discover the world through their senses. They move their head toward a sound. Their vision guides their eyes toward movement or light. They maintain life through their sense of taste. As they grow, they begin to explore the world with the addition of their vestibular and proprioceptive systems – rolling over and pulling up to become active players in the world in which they live. And from the moment that they discover their hands, they begin to stretch and reach to learn more about the objects around them. From this time on, their hands provide the medium for manipulation, exploration, and expression. Learning through the use of their hands, as well as their vision, opens the door to curiosity and creativity. Handwriting it the process through which the writer uses his hand to produce letters, words, and sentences on the page in order to convey knowledge or thoughts. Writing, on the other hand, is the vehicle that transforms handwriting into a means of expression. (3) Revision to recreate the text for improved clarity and idea expression. In that same report, Graham and Perin site statistics that reflect Mr. Gregorian’s reason for concern. Seventy percent of students in grades 4-12 are low-achieving writers. College instructors estimate that 50% of high school graduates are not prepared for college-level writing. The knowledge and skills required for higher education and employment are now considered equivalent. Writing, with its requirement that the “writers formulate their own thoughts, organize them, and create a written record of them using the conventions of spelling and grammar,” (8) demands certain efficient cognitive skills. Information about letter formations and sounds, word and sentence structures, as well as the principles of grammar, must be accurately stored in memory, available for quick retrieval, and produced automatically in order to free up the cognitive skills needed for the writing process. Considering the evidence that handwriting affects the grading of a student’s work, (9) legibility must be considered to be an equal partner in the development of skilled writing. Technology, keyboarding in particular, has been suggested by many to be a viable, more timely substitute for handwriting. Computers are expected to replace the need for handwritten work in the educational system due to the increased demand for keyboarding skills in the workplace. And typewriting has been perceived to be equally as effective in the development of writing skills. Considering the research that strongly suggests a tie between writing movements and letter memorization and the relationship of cognition with perception and motor action, (6) as well as the link between automaticy in handwriting and skilled writing skills, (10) the substitution of typewriting for handwriting warrants research. Mangen and Velay, in their article, Digitizing literacy: reflections on the haptics of writing, (6) reported upon the significant differences between the motor movements involved in handwriting and typewriting. Handwriting produces a strict and unequivocal relationship between the visual shape (of the letter) and the motor program that is used to produce the shape, with each letter associated with a given, very specific movement. They report that typing is a “form of spatial learning” that requires the writer to transform the visual form of each character into the position of a given key, turning the movement to create thoughts into a visuomotor association linked with pointing movements and characters on the keyboard. In that light, they felt that the less specific typewriting movements should provide little in the way of visual recognition and memorization – Memorization that is required for automaticy and skilled writing skills. Handwriting cannot be ignored as an important step on that pathway. To read Week 1’s Posting in the Series, please scroll down past the references! (2) Johansson, Roland S., and J. Randall Flanagan. “Coding and Use of Tactile Signals from the Fingertips in Object Manipulation Tasks.” Nature Reviews Neuroscience Nat Rev Neurosci 10.5 (2009): 345-59. Web. 19 July 2015. <http://130.237.111.254/ehrsson/pdfs/Johansson&Flanagan-2009.pdf>. (3) Renaud, Jean-Paul. “Good Handwriting and Good Grades: FIU Researcher Finds New Link.” News at FIU Florida International University. Florida International University, 08 Jan. 2012. Web. 19 July 2015. <http://news.fiu.edu/2012/01/good-handwriting-and-good-grades-fiu-researcher-finds-new-link/34934?utm_source=rss&utm_medium=rss&utm_campaign=good-handwriting-and-good-grades-fiu-researcher-finds-new-link>. (4) Daly, C. J., G. T. Kelley, and A. Krauss. “Relationship Between Visual-Motor Integration and Handwriting Skills of Children in Kindergarten: A Modified Replication Study.” American Journal of Occupational Therapy 57.4 (2003): 459-62. Web. 19 July 2015. (4) Daly, C. J., G. T. Kelley, and A. Krauss. “Relationship Between Visual-Motor Integration and Handwriting Skills of Children in Kindergarten: A Modified Replication Study.” American Journal of Occupational Therapy 57.4 (2003): 459-62. Web. 19 July 2015. (5) The University of Stavanger. “Better learning through handwriting.” ScienceDaily. ScienceDaily, 24 January 2011. <www.sciencedaily.com/releases/2011/01/110119095458.htm>. (6) Mangen, Anne, and Jean-Luc Velay. “Digitizing Literacy: Reflections on the Haptics of Writing.” Advances in Haptics (2010): 385-401. Web. 26 June 2015. (7) Berninger, Virginia W., Robert D. Abbott, Amy Augsburger, and Noelia Garcia. “Comparison of Pen and Keyboard Transcription Modes in Children With and Without Learning Disabilities.” Learning Disability Quarterly 32.Summer 2009 (2009): 123-41. Sage Journals. Web. 6 July 2015. <http://ldq.sagepub.com/content/32/3/123.abstract>. (8) Graham, Steve, and Dolores Perin. Writing Next: Effective Strategies to Improve Writing of Adolescents in Middle and High School. Alliance for Excellent Education. Alliance for Excellent Education, Sept. 2006. Web. 24 June 2015. <http://all4ed.org>. (9) Gentry, J. Richard, Ph.D., and Steve Graham, Ed.D. “Creating Better Readers and Writers: The Importance of Direct, Systematic Spelling and Handwriting Instruction in Improving Academic Performance.” Saperstein Associates. Saperstein Associates, n.d. Web. 07 July 2015. <http://www.sapersteinassociates.com/>. (10) Graham, Steve. “Want to Improve Children’s Writing? Don’t Neglect Their Handwriting.” American Educator Winter.2009-2010 (n.d.): 20-25. Web. 26 June 2015. Disclaimer: The information shared on the Handwriting With Katherine website, blog, Facebook page, Twitter page, Pinterest page, or any other social media is for general informational purposes only and should not be relied upon as a substitute for sound professional medical advice or evaluation and care from your physician/medical team or any other qualified health care providers. Therefore, the authors of these links/posts take no responsibility for any liability, loss, or risk taken by individuals as a result of applying the ideas or resources. Welcome back to our Summer Handwriting Fun series! This week we are sharing some very creative ideas that will spark your children’s interest in building handwriting development skills! 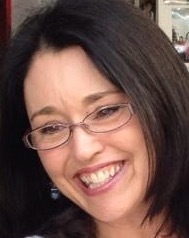 Our guest blogger is Stacy Turke, OTR/L, an Occupational Therapist from Michigan! I think you will find her suggestions helpful and easy to do. If you think so, too, drop her a note and let her know how much you’ve appreciated them. Okay, Stacy, you’re on! For many kids, this statement is an oxymoron: how can ANYTHING related to Handwriting be fun? Good handwriting takes practice, lots and lots of it, and practice of almost any kind is boring. Plus, kids want to be outside playing in the summer, or inside creating, and just generally having fun with their families and friends. So a Summer Handwriting Program is a waste of time, right? Not if it’s done well! …and all that comes before the child begins to put pencil to paper to write down the language in their mind’s eye. Practice the skills in these areas, and you’ll help your child maintain and strengthen their ability to write while having fun, without the feel of homework or practice. Who wouldn’t want that?! So what EXACTLY do you do to practice? There is no concrete, universal “Practice THIS List” because every child’s needs are unique and individual. So instead of a “prescription,” consider these general areas and suggested activities to create a strong foundation for handwriting, and then get creative! Blogs, such as Handwriting with Katherine (you’re there now!). 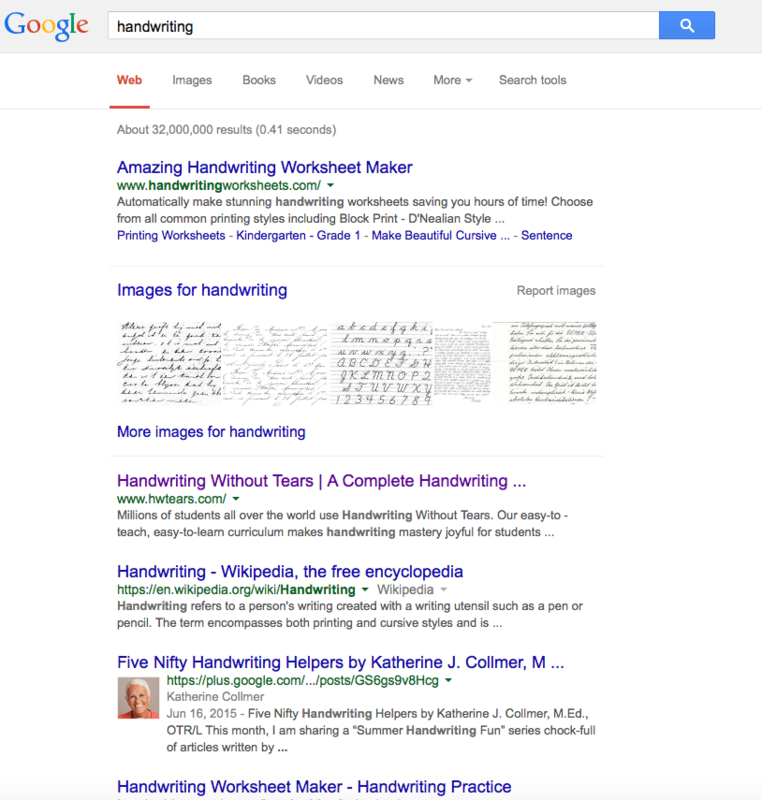 Also Google “handwriting,” or any of the skills listed above for more blogs. type in “key words” such as, “children, occupational therapy, or education.” If you have a favorite Facebook page that discusses children’s activities, click on its “Likes” section and browse through the sites there. Again, if you have favorite Tweeters that you enjoy, take a look at their profiles and click on their “Follows” and “Followers” ———-> for more suggestions. You will find more activities that you have summer-time for! So how EXACTLY do you get creative? Consider the things your child likes to do, and then expand or adapt to allow for greater targeted practice and skill development. With my students, I typically begin with a whole body task or activity, something that will get all the muscles and joints working. 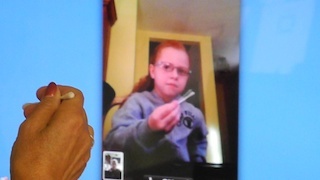 then, we will move on to an activity that uses the small muscles of the hand and fingers. After all that, we get a little actual penmanship practice in, once the body is ready for that level of focus. Strengthening both the core and fine-motor muscles helps to build the foundation for handwriting skill development. Let’s see if this strategy will work for your child! As with any strengthening program, begin with very small expectations, and slowly build the amount of time your child engages in these tasks or with these materials. 1. First, try these activities to help to wake up and strengthen all of the muscles, including core muscles and the muscles of the arms and legs, all at the same time. -Practice Simple Calisthenics (sit-ups, push-ups, jumping jacks, etc.). -Visit the local park and climb/slide/swing on the playground equipment. -Walk or run. Bonus points for walking the dog! -Include some Screen Time (believe it or not): Websites like GoNoOdle offer fun, brief “brain breaks” that involve movement and music. Many kids will be familiar with GoNoOdle because their teachers use it in their classrooms! 2. Next, try these to Engage the Shoulders and Arms. These activities will help strengthen the larger muscles of the shoulder and arm, while still being fun and engaging, and will also help support bilateral coordination (using both sides of the body together). -Play on the floor on the tummy, propped up on elbows. -Push-ups on the floor if your child can manage this, or against the wall: Place arms shoulder height on a wall, approximately shoulder width apart. Take a step back from the wall. SLOWLY bend the elbows, bringing the face close to the wall, then SLOWLY push the body back to the starting position. -Carry bags with groceries from the car. -Use a spray bottle with water and “wash” the windows using big arm movements. -Play in a sandbox or on the beach with shovels, buckets, trucks, etc. -Sweep the sidewalk or the house. -Create artwork with sidewalk chalk on the sidewalk or vertical chalkboard. -“Paint” (using simply water and a 1-2″ paintbrush) on the garage door or sidewalk. -Use the water and paintbrush idea to “erase” a picture drawn with sidewalk chalk outside. For more activities, try these suggested searches or hashtags: #bilateralcoordination #shoulderstability #shouldercoordination. 3. Then, move on to Engage the Hands and Fingers. These activities will support and strengthen the muscles and joints of the wrist, fingers, and thumb. Bonus points if you combine several together creatively! -Play with playdough: roll it; pinch it; hide small objects within it and find them by pinching or twisting; cut rolls using scissors. 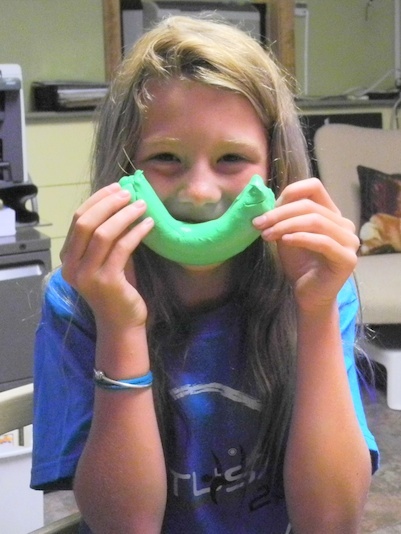 -Play with Silly Putty: Use in the same activities as with the playdough. Or create design “transfers” by pressing silly putty onto a newspaper comic or simple pencil drawing and peel away to reveal a picture. Insert Q-tips into the holes in the tops of cleaned out spice containers. -Insert Q-tips into the holes in the tops of cleaned out spice containers. -Use small tongs or tweezers to pick up mini erasers or other small objects. Push small pompoms into parmesan cheese containers. -Build with Duplo or Lego bricks. -Rip up strips of paper, then use a mini “broom” and dustpan to sweep up the pieces. -String fruit-loop type cereal onto yarn to make a necklace. 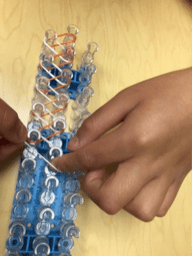 Create a bracelet using a rubber band loom. -Create a bracelet using a rubber band loom. 4. Now it’s time to write. After all the above preparation, your child is ready for a little handwriting practice. My recommendation is that, whatever process your child is using, whether it’s a structured, formal handwriting curriculum or if it’s something that is more teacher created, it is important to offer opportunities to practice each letter, numeral, or word repeatedly. After all, one time through a workbook is rarely enough for kids to demonstrate mastery of a skill. If you don’t have a writing program provided by your child’s teacher or OT, you can easily find some type of handwriting practice workbook at your local Target, Walmart, or similar store. You can also Google #freehandwritingworksheets (or similar key words) and you will be able to choose from all sorts of free resources online. What about those kids who HATE to practice? We write notes to ourselves. We send letters to their parents, grandparents, or friends. My students make lists of the movies they want to see or of their favorite foods. 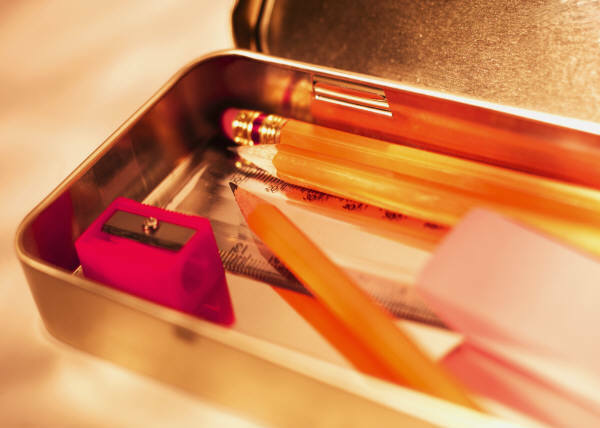 Keep a box of different types of writing tools and materials readily available for your child. Crayons, both primary sized and the more traditional sized. Pencils, both traditional and mechanical, and pencil grips. And papers, to include lined, unlined, and construction. My favorite writing practice tip? Take that workbook you’ve purchased or been given and either tear the pages out and place them into clear plastic page protectors in a binder, or use a clear plastic overlay on each page. Using a dry-erase marker, you’ve created reusable practice pages, and your child can practice over and over until letters and numbers are legible and written with ease. Aim for about 5-10 minutes of writing practice after the warm ups (above), several times per week in the summer. If you can. 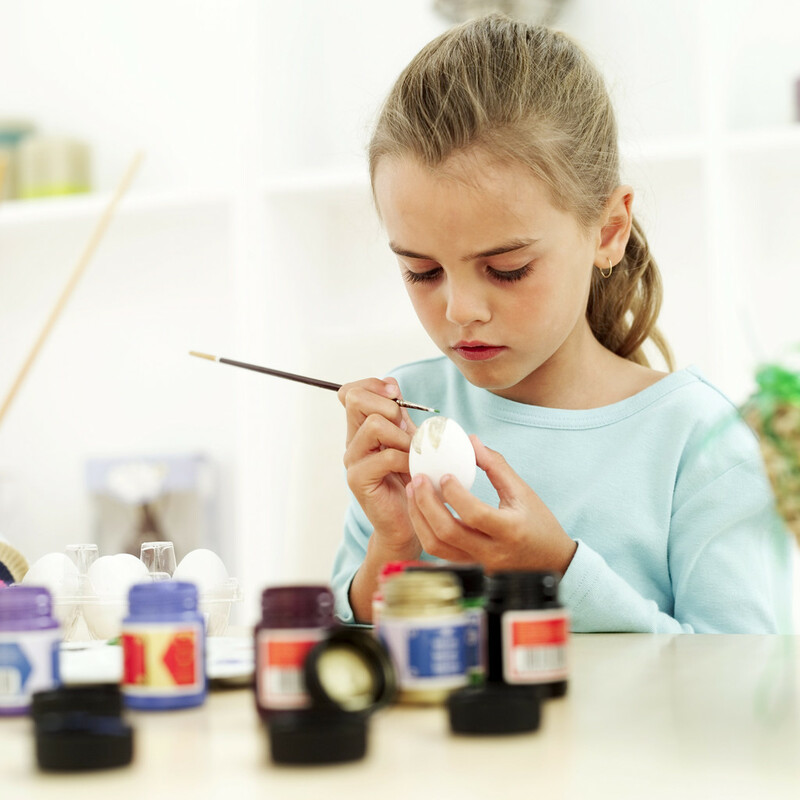 If you can’t…just make sure your child is playing, creating, and helping around the house. Keep your approach light and playful, and you will have your child working on improving their handwriting all summer long…and he or she might not even know it’s work! Stay tuned! Next week, we will begin our Techie Series. Hope to see you then! My Handy Handwriting Tool Box: A q-tip, cotton ball, and some sandpaper! During my first year as a pediatric, school-based occupational therapist, I became a hoarder. Yes, I can openly admit it. A bone fide hoarder of gadgets, gizmos, whirligigs, and thingies. If something even hinted at me that it could be used toward the development of any imaginable skill, I stuffed it into my car trunk. Soon, the trunk became a California Closet, with bins and buckets and baskets. At this point, of course, I needed a “more efficient” mode of transportation between car and school. And out came the roller boards and sail bags! Soon, I stopped going to the gym because my day job became my daily workout! Yep. I had lots of stuff. But in the end, the economy of energy and time demanded that I spend a weekend sifting through my collection to determine what I actually did use (kind of like Pinterest!). My OT Tool Box is quite small now and actually lots more fun. Today, let’s chat about three simple Handwriting Helper Tools that are small, inexpensive, and very functional! Handwriting development and remediation should encourage students to develop tactile, fine motor, and postural skills. These will build a solid foundation for a fluid, legible handwriting style. I keep three tools handy that can address these skills during fun, “I don’t even know I’m practicing my handwriting,” activities! A q-tip helps develop the fine motor muscles of the hand for handwriting. 1. A q-tip: The length and circumference of a q-tip is just perfect for developing the tripod grasp. It does not leave much room for any additional fingers! The goal is to work on the tactile and fine motor development of the thumb, index, and long fingers on the “barrel” versus placement in the webspace of the hand. It is light and encourages the students to put pressure on their fingers to control and manipulate it. At the same time, its weight allows students with weaker hands to participate in the activity more easily. They are inexpensive and can be purchased at any discount dollar store. Prone to be Good Practice: Toddlers and preschoolers will enjoy lying on their tummies and propped up on their elbows while they paint with their q-tips on a large piece of paper taped to the floor. This builds postural strength while they develop their age-appropriate grasping skills. Wall Workout: Shoulder, arm, and trunk muscles get a nice workout with activities that are taped to the wall or completed on a chalkboard. * Pre-schoolers, kindergarteners, and elementary students can practice tracing over lines, shapes, letter formations, and words with their dry q-tips on paper taped to the wall. They can “erase” those that have been written in chalk on construction paper or on a chalk board using their q-tip dipped in water. Be sure they are following the appropriate directional concepts. I Can See You: Students can build their tripod grasp, as well as shoulder strength and visualization skills, by writing with their q-tip in the air. This is a simple warm-up activity to introduce a new letter formation. Provide a visual demonstration of the letter on the board, with auditory directions as you write it. With your back to the class, draw it in the air with your q-tip using the same auditory directions. Then have the students mimic you as they draw them in the air as well. 2. A cotton ball: A cotton ball comes in handy for the development of pencil grasp and letter formations. It is light and compact and allows students to work on tactile and visual skills any time, any place! A bag of cotton balls is inexpensive and easy to carry in your tool box. Got You In The Palm of My Hand: Students who struggle with keeping their ring and little fingers in the resting position and off the pencil barrel will find a cotton ball to be their friend! They can tuck it into the palm of their hand and use those two fingers to keep it in place as they practice their handwriting. This will build the motor memory for a tripod grasping pattern. They can use it during art work, too! It’s a hidden tool that, even if it falls on the floor, it’s a silent partner! The Cotton Ball Game helps build efficient visual skills. Cotton Ball Races: Students of every age enjoy this game! It can be done with or without a straw, on a table or on the floor. Very versatile! Blowing at the cotton ball encourages the development of eye convergence – bringing the eyes together to view close work. If you add a target to aim at, the game also works on accommodation skills – switching between close and far work with ease and efficiency (like copying from the board). 3. Some Sandpaper: Sandpaper writing or drawing encourages the development of tactile awareness and enhances a student’s ability to determine how much pressure he is exerting on his fingers and on the pencil. A too light or too heavy pressure can slow down a writer and lead to hand fatigue and illegible handwriting. Sandpaper can be purchased inexpensively and is reusable! Rub It Off: Place a drawing or handwriting worksheet that’s been completed in pencil on top of a piece of sandpaper that been cut to the same size. Have the students erase the pencil marks with a pencil top eraser to “make it new again.” The sandpaper provides tactile input for pressure control. They will have to exert the “just right” amount of pressure to be sure they don’t tear the paper. If they are working on letter formations, be sure that they erase in the appropriate directions to encourage motor memory development. You can add shoulder and trunk skills if you tape this activity to the wall or perform it on the floor! Step-by-Step Drawing: Have your students use a pencil** to complete a step-by-step drawing activity or to copy a picture on paper over sandpaper. The sandpaper will provide tactile awareness for the controlled fine-motor movements necessary for duplicating specific lines and shapes – just like letter formations. And again, the students will be practicing their pencil pressure skills to be sure that their drawing is visible and that they don’t tear the paper. You can substitute the bond paper with heavy-duty tissue paper to increase the challenge for those students in the final stages of mastering pencil pressure. You can add postural strengthening by taping the activity to the wall or on the floor. As always, thanks for reading! See you next time! *A chalkboard provides more tactile input than a dry-erase board and develops pencil control skills. **A pencil (or chalk) provides more tactile input than a marker and encourages the development of pencil pressure and control skills. Katherine J. Collmer, M.Ed., OTR/L, is a pediatric occupational therapist who specializes in the assessment and remediation of handwriting skills and understands the link between handwriting skills and writing. You can contact her and purchase her book, “Handwriting Development Assessment and Remediation: A Practice Model for Occupational Therapists,” through her website, Handwriting With Katherine. If the seed for our personal handwriting style… our creative interpretations for the message that we want to convey…remains in our scribbling memories, wouldn’t a bit of drawing practice help a struggling child find his way naturally toward handwriting success? That’s what we are here to discover today! Art, handwriting, and creative writing are all forms of communication for us. They share a common ground for “getting our message across.” But children begin to try their hand at communicating from the day they are born. Yes, we all have the desire to put our ideas into some form of communication. In my “Life is A Series of Baby Steps” blog on the Child Development Club website, I ask that you “Give Them The Space and They Will Create!” Providing space for art allows children to”talk to you” with an arrangement of colors, shapes, and elements that are a language in and of themselves! She emphasizes that the development of hand and finger strength brings scribbling into the realm of producing “circles, ovals, squares and crosses….” Handwriting skills are developed long before a child even begins to think of the alphabet. They are experimented with and honed during the most exciting part of learning – play! Play without pressure. Play for the sake of play. But, you may be asking, how can all of this “freedom” turn into efficient handwriting skills? Well, let’s take a look! And I say, aren’t the manuscript and cursive letters of the alphabet simply abstractions? Symbols created to depict what we see in our “mind’s eye” in order to translate a picture symbol that we would immediately recognize into a language that society has deemed conventional. Again, I suggest, wouldn’t drawing be the perfect medium for handwriting instruction and remediation? Art is there for the taking! Efficient handwriting requires some very complex skills that can be developed in some very simple ways. Children seem to know what they need to do to sharpen these skills when they are given the freedom to experiment. You don’t have to look far to find those simple ways to hone handwriting skills. I am honored to share with you some of the excellent artistic/handwriting skill development ideas from two of my favorite sources! Just to help out a little, I’ve linked Vanessa Levin’s ideas with the handwriting skills that Lisa Marnell will define for us to guide you toward the “freedom for learning” that will link art and the development of efficient handwriting skills. Have fun exploring! 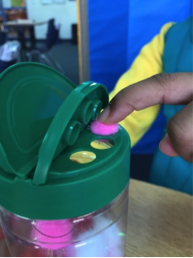 Vanessa Levin, Pre-K Pages, in her blog,“What’s in Your Writing Center?”, provides a very simple, sensory-motor collection of tools that allow children to explore and learn. Lisa Marnell, Handwriting Help for Kids, shares an excellent outline of the five basic skill areas for handwriting from an occupational therapist’s point of view. Vanessa offers sandpaper alphabet rubbings to encourage visual motor skills with a touch of sensory input and alphabet stamps and pieces for creating pictures while they sort and identify the letters. I love to use worksheets that provide budding artists with the chance to use their letters and art to connect the symbol with the letter formations. 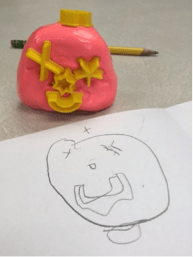 A wonderful way to connect the “visual” with the “motor!” You can even make your own worksheets at Enchanted Learning! Vanessa provides plenty of opportunities for experimenting with visual processing skills. Her cutting center and alphabet pieces work well for vision scanning and tracking as they create pictures and crafts. I enjoy Childhood Beckons’ “Storytelling With Illustrations” activity that asks children to visualize their story and produce it on the chalkboard. Vanessa provides plenty of opportunities for children to be creative using their hands with cutting, gluing, stamping, and even stapling, complimenting these with Wikki Stix, lacing, and and even fishing activities! In lieu of issuing pencil grips, I like to see a child work on developing these skills. Vanessa’s Writing Center appears to be a “free-form” area where students are encouraged to work standing, walking around the room, or even on the floor. Drawing, coloring, cutting, or pasting can be done during “big-kid tummy time.” They are working on trunk control as they support themselves on their elbows and maintain their head and neck position in order to see their creations! I like to hide the pieces of our craft project in various corners of the room, presenting the work as a “ground-floor project” where we all crawl to find them and complete the work on our tummies! It’s fun. Try it! Vanessa works on shoulder strengthening with clipboards to write and draw on and stabilize as they walk around the room or during tummy time! I am especially partial to having children draw on the board or any vertical surface to encourage the development of their shoulder muscles and joints. Children always enjoy being the teacher! Lacing is a fun handwriting warm-up! The developmental stages that lead to handwriting mastery begin in infancy and continue to develop through elementary school. Learning how to grip a pencil appropriately depends upon the development of the hand, vision, and the brain. These connections provide the foundation – and they can be developed through play! In Part 3 of our “Modern Handwriting or Hieroglyphics” series, we will discover the artistic ventures that can help our older strugglers with their handwriting mastery! I hope you will join me and share your thoughts! Be sure to check out Part 1 in our series! I have always been one to say, “Well, that was nice but next time…. !” I am never quite satisfied with the status quo. If something didn’t happen quite the way I’d expected, I went on the hunt for a different way to approach it. That’s not to say that I always found a better way – simply a different one. Today I’d like to take some of those lessons learned and turn them into Handwriting Tips for Getting It Right the first Time! Let’s go, shall we? Tip 1: Never buy a house with a wet basement. Tip #1: Never buy a house with a wet basement. Wet basements are the ultimate turn-off for me when I’m looking for a new home. A soggy bottom means a weak foundation. This hold true for handwriting skills, as well. The early learning stages MUST be built soundly in order for a young writer to develop the appropriate skills for pencil grasp, letter formation and recognition, and fluid handwriting. A weak foundation will result in lots of expensive “remodeling” later on! Tip #2: Birds do not nest in painted birdhouses. Tip 2: Birds do not nest in painted birdhouses. Yes, that’s true! When we purchased our nifty birdhouse a few years back, I asked the builder why he didn’t paint them? He told me they were “put off” by the paint. Voila! A new fun fact is learned! The same truth can be applied to handwriting practice. If students who are struggling with handwriting skills are discouraged and put off by desk work and pencil-and-paper activities, then it is certainly counterproductive to ask them to spend time on them. Handwriting practice and remediation can be accomplished with plenty of activities that get them up and moving, that provide them with opportunities for art work, or simply look like child’s play! Painted birdhouses mean they will be empty. No sense in that, eh? Tip 3: Less is more! Tip #3: Less is more. As my hubby and I are downsizing and getting ready to move to Arizona, we have come to realize that this saying has enormous value! Phew! Who knew that two people could accumulate so many useless things? They must have been useless because some of them I haven’t even touched in the past 10 years! Having “more” certainly didn’t make our life any better. This same truth is a vital link for handwriting mastery. Practicing letters or words over and over, whether they be on a chalkboard, paper, or in sand, can become tedious and boring. Again, working on the fine and visual motor skills that lay the foundation is more fun and will enhance handwriting skills without your child even knowing he is practicing handwriting! Less boring = more learning! Tip #4: Don’t believe in coincidences. Tip 4: Don’t believe in coincidences. The old saying “It was meant to happen” is one that allows us to believe in coincidences. If an event occurs, we can accept it without complaint and step away from the challenge of changing it. Coincidences in handwriting are events that make it easy to accept sloppy and illegible skills. They are the times when we say, “Well, we won’t need handwriting soon because technology will replace it.” Or, “Why would I waste time on handwriting skills when he only needs to learn keyboarding?” The increased use of technology and its capabilities is only a coincidence. Handwriting skills have been and continue to be an important facet of learning – ones that continue to need instruction and remediation when they fall short. Believing in coincidences can stand in the way of a child’s educational success. Now was THAT meant to be? Tip 5: Money doesn’t grow on trees. Tip #5: Money doesn’t grow on trees. It doesn’t? Man, don’t dash my dreams just yet! Funny, but I think I’ve heard just about every parent I’ve met say that to their child at least once in my presence! Having money is a good thing, of course; but, as we’ve all learned in the end, it needs to be earned and saved. Handwriting mastery works the same way. The skills a child needs for fluid and legible handwriting must be taught using a STRUCTURED PROGRAM, with CONSISTENT PRACTICE, and with GUIDANCE. They don’t simply grow on trees naturally where they can be plucked off when we need them. They grow with practice and remediation. Pictures above that are the property of the author and link to an attachment page must provide a link back to this article or her website. Pictures that are the property of an outside site should include the link provided with the photo to give proper credit to their owners.